SongFest uses a YapTracker application. You do not need to be a paid subscriber to YapTracker to use this application form. Need help? Access the YapTracker Tutorial. Early applications are encouraged. Application is required PRIOR to scheduling a live audition or uploading a YouTube audition. ONLY completed YapTracker applications will be processed. Link to APPLY Coming Soon. After written notification of acceptance, a $500 NON-REFUNDABLE DEPOSIT will due in 2 weeks. Accepting Recorded Auditions until February 12, 2018! Audition Date: Nov 18, 1-5 p.m.
Audition Date: Dec 5, 1-5 p.m. / Dec 6, 10 a.m.-3 p.m.
Audition Date: Jan 9 & 10, 9 a.m.-3 p.m.
Audition Date: Jan 19, 10 a.m.-6:30 p.m.
Audition Date: January 20, 1-7:30 p.m.
Audition Date: January 21, Noon-9 p.m.
Audition Date: Jan 26, 11 a.m.-6 p.m. / Jan 28, 4-9 p.m.
Audition Date: Feb 2, 11 a.m.-6 p.m. / Jan 28, 4-9 p.m. Please prepare three art songs in three different languages, one must be in English and an aria. Optional: you may prepare a fifth selection that highlights a special interest (new-music, musical theater, oratorio, etc.). There will be a pianist provided at auditions for no fee (you may bring your own.) Please send repertoire selections 1 week prior to audition. Professional Participant Kelly Newberry with John Musto at the piano. 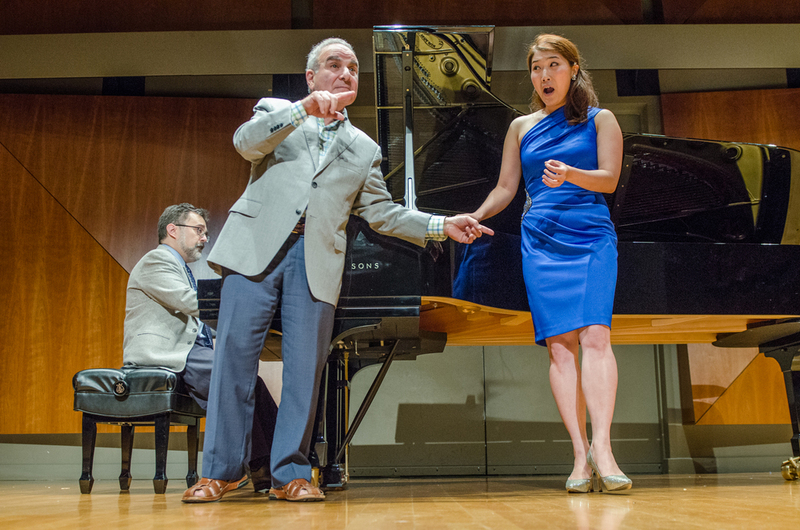 Martin Katz teaches Stern Fellow Yoongeong Lee in a master class. From Left to Right: Stern Fellows soprano Melanie Henley Heyn & bass-baritone Jesse Malgieri, Sorel Organization Executive Director Judy Cope, Composer Anne LeBaron, and Stern Fellow pianist Gloria Kim after their performance of a world premiere commission by Anne LeBaron, funded by the Sorel Organization: "Radiant Depth Unfolded"
2014 Professional singer Tiffany DuMouchelle and pianist Elena Fomicheva perform in Zipper Hall. 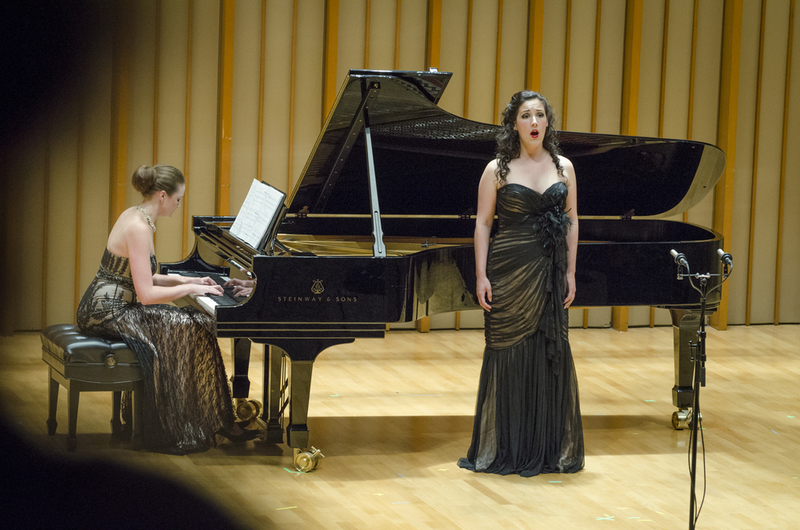 SongFest is the United States' premier art song festival and training program held each June at The Colburn School in Los Angeles. SongFest attracts an international roster of leading recital artists and pedagogues as well as students from some of the nations top conservatories. The program provides a rigorous curriculum addressing the concerns of the 21st-century singer and collaborative pianist with classes in acting, movement, diction, repertoire and career guidance workshops, daily master classes taught by an international roster of master artist teachers and pedagogues, collaborations with leading American composers, the presentation of at least one commissioned world premiere every summer, and an exciting concert series presented at Colburn's state-of-the-art venues. Our five programs (Studio Artist, Young Artist, Professional Fellowship, Pianist, and Recital Fellowship) provide intensive instruction in song tailor-made for every level: from freshmen in college who are learning their first art songs to established recitalists perfecting their repertoire. All students live on campus in the beautiful Colburn Conservatory dormitory. The residences at The Colburn School consist of fully furnished three-bedroom and four-bedroom suites. Each suite contains a living area; kitchenette with a microwave, coffee maker, refrigerator and sink; a shared bathroom; and single bedrooms with extra-long twin beds, wardrobes and desks. Four-bedroom suites have two bathrooms. Limited Scholarship is available for those in need of assistance. Young Artist Rebekah Howell in concert. A non-refundable $500 housing or commuter fee deposit (which will be credited to the balance of fees) is due received two weeks after acceptance into the program. A partial refund of $1000 will be given on housing/meals if notified IN WRITING and received by April 1st. After April 1st, no refunds will be given for any reason on any portion of the fees (tuition, housing/meals), including the non refundable $500 deposit. The SongFest Recital Fellowship program provides free tuition, housing, and meals. The SongFest Professional Fellowship program provides free tuition. (Housing & meals not included) Limited extra need-based aid is available for housing/meals. Several merit scholarships are available for our Studio Artist, Young Artist, and Pianist programs thanks to the generosity of our donors, faculty, and board members. Limited additional need-based aid is available to those who demonstrate financial need. More information on scholarship opportunity. Coach Mark Trawka with Professional and Young Artist singers after the LA Composers Concert.